We marinate bite-sized pieces of fresh salmon in a sweet ginger sauce then thread them on skewers and pan-fry until golden. Served with a crunchy rainbow slaw, brown rice and honey lime dressing. 1. Boil a kettle. Rinse the brown rice and place in a saucepan with 400ml boiling water and a pinch of sea salt. Simmer for 20-25 mins. 2. Peel and finely chop the ginger. In a bowl, mix together the honey, tamari, ginger and half of the juice from the lime. Place half of this mixture in a separate bowl. Cut the salmon fillets into bite-sized pieces (around 2cm) and place in one bowl of the sauce to marinate for 10 mins while you prepare the rainbow slaw. 3. To make the rainbow slaw; peel the carrot and cut into matchsticks (or use a julienne peeler or spiralizer if you have one). Slice the radishes and sugar snap peas thinly. Place the vegetables in a bowl and drizzle over 1/2 tbsp oil and the remaining lime juice. 4. Thread the salmon pieces onto the skewers. 5. Heat a griddle pan on a medium-high heat, add 1 tbsp oil (making sure it is well oiled to prevent sticking), then add the salmon skewers for 10-15 mins and turn every 2-3 mins until the salmon is cooked through. 6. Drain the brown rice. 7. 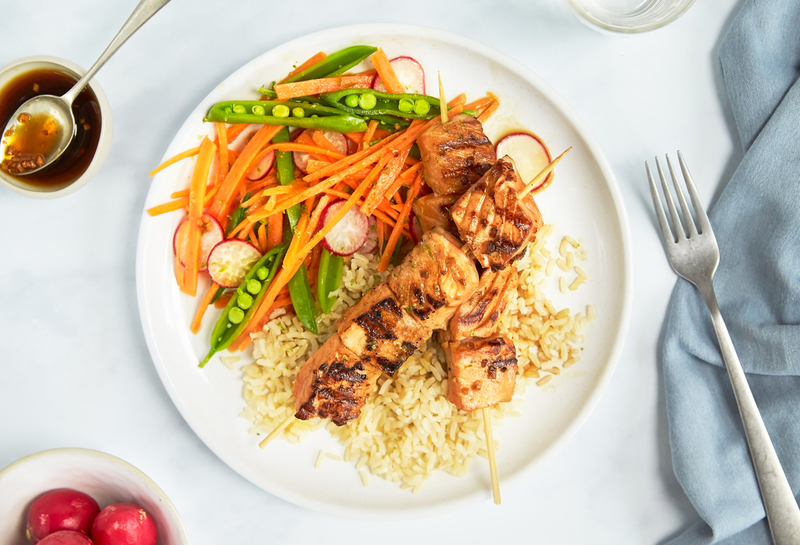 Spoon the brown rice onto two warm plates, top with the salmon skewers and serve alongside the rainbow slaw. Drizzle over the remaining sauce.